I’m extra happy to check this project off My Crafty List of Things to Do. I’ve been wanting to make a box cushion dog bed for Maisy for well over a year. I had gotten as far as ordering a 10lb bag of organic buckwheat hulls from Northern Quinoa last November and then the project fell to the wayside. When Erin approached me about doing some introductory upholstery classes, I knew the box cushion would make a great class and help kick start this personal project of mine! I had originally wanted to make the cushion out of Denyse Schmidt’s Cheater Print fabric from her County Fair Home Dec line, but changed my mind last minute to this dark Tulip Medallion print from the same collection. This sweet little print has grown on me in the last couple months. I really enjoy testing out new classes and being one of the students. It’s amazing how many ways there are to insert a zipper in your sewing. I love the version we did here and Erin showed us how to make a little pocket for the zipper pull to slide into. I now wish that I had chosen to do contrast piping. Lauren did and it really added another level of detail. I will definitely do that on my next one. Each of us also made a muslin casing to cover the inside (foam, rice, buckwheat, etc) and make it super easy to care for and wash our cushion covers. This clever feature alone, makes me want to recover every box cushion I own. At first Maisy was completely wary of her new bed and would hide when I called her over to it. Perhaps because I was so insistent that she get in it for a photo. I ended up laying out pieces of cheese all over it to get her to realize how great it really was. This is beautiful! I want to get my couch upholstered so badly, but I’d love to do my own seat cushions. Great idea using buckwheat hulls inside. Do they make it smell nice? Hey Karyn – I’m not sure what’s cuter the box cushion or Maisy…and the two of them together is the best! Looking forward to Sunday’s Trunk Show so much…see you soon. I want a teacher like your Erin! I want to know how to make things I’ll actually use! I am so happy that Maisy has come around to loving her amazing new bed. What is not to love about such a beautiful bed, covered in Cheese to boot! LOVE LOVE LOVE LOVE LOVE LOVE LOVE LOVE LOVE Maisy!!! The new bed is pretty smashing too. I love love love love the cushion. I’m trying to find time to make sure I get into a basics class at the workroom… but just for planning purposes how many lbs of hulls did you need to stuff her bed? Rach – good question. 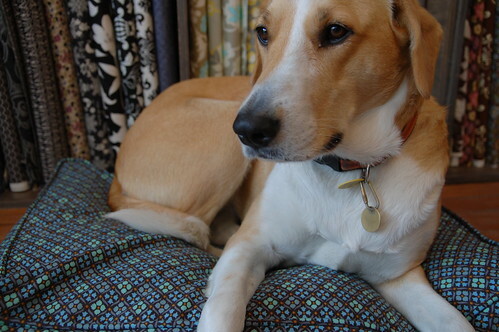 maisy is a collie and walker hound mix…. we don’t know what her dad was, so there are definitely a few more breeds in there… i’d love to do one of those doggie dna tests and find out!